What if they used some type of magnetic induction coil to do it? these pieces apparently also have magnetic traces. Not all of the stones, just some of the ones in their generators of course. You know, the big granite ones that are 60% quartz. They were smart enough to know that AC is superior and more natural, and DC causes too much waste, so no rectifiers required. On that point, the AC was useful because they also were very knowledgeable about resonance. Not just of sound, but of electricity. You can ring a bell physically, and electrically, if you catch my drift. Even if a material is not a conductor, they knew how to create electric waves in that material. It was important for them to know how long it took for the waves to reach one end of the object and then return, because then they would just push the wave again, like a child on a swing, or like a Tesla coil... at the resonant frequency. Thankfully it is easy enough to determine resonant frequency simply by the dimensions of the objects. That is why the Golden Ratio and Fibonacci sequence and Phi are all found in their designs. They understood how these ratios can be used to make perfect acoustic resonators, and that they can be used for electric resonators too. Sorry, but your explanation does not fit the evidence. The implication of moulding would be that every H-block would look the same since they came from the same one (or few) moulds. Unfortunately for your theory, the several dozen examples that exist are ALL different - they were made individually. Your theory presumes ones of the myths of Puma Punku, namely, that the H-blocks were mass-produced somehow. On the contrary,they show small differences indicating that they were made individually and certainly NOT from one or two slightly different moulds. One would expect to find at least two that are identical. Instead, one encounters NONE that look the same. As for the one with a dodgy inside corner, well, that one made by an apprentice got past the quality inspector, didn't it? I mean, not even the Pumu Punku craftsmen were perfect! Each mold could perhaps be destroyed in the process so that each block needed a new mold made. Thanks a lot, that's quite flattering indeed! I'm really overwhelmed by the reactions to this thread and I'd like to thank everyone on here for contributing to the discussion. Getting back to the OP, we still don't know how molding techniques could apply to what we see in the image below but perhaps a slightly different process was used in that case. 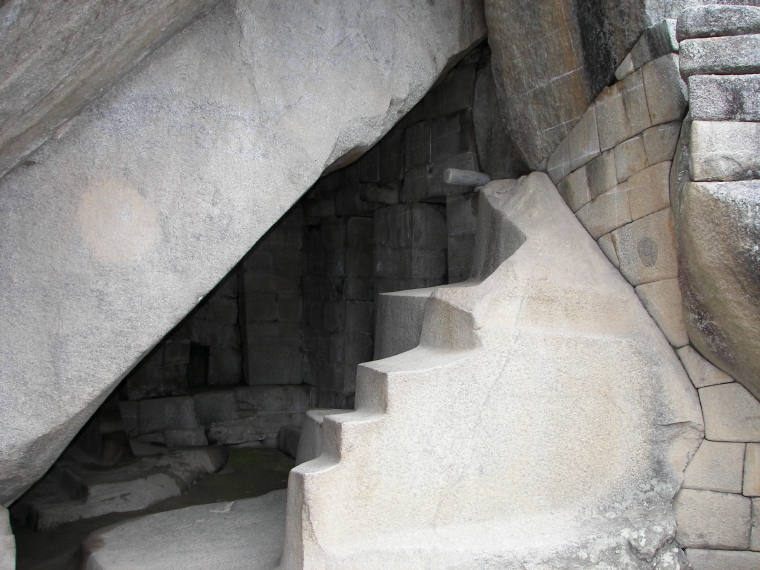 This megalithic cluster can be seen at Machu Pichu and is known as the royal tomb. 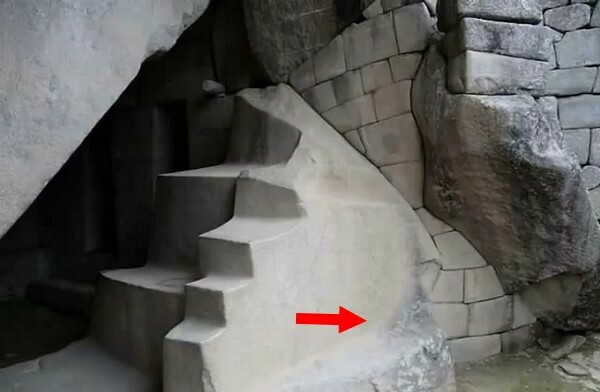 Note the transition from the rough stone surface to the more smooth looking one, indicated by the arrow. Would be interesting to take samples from that site as well IMO. Outstanding post and substantially more plausible (and believable) than the ridiculous Ancient Aliens narrative. While I am a advocate for ET life it bothers me greatly the first thing people run to when we encounter something "unexplainable" or "mysterious" are aliens. Thanks for the well thought out post! That's a great point regarding acoustic resonators. Your belief is they understood through discovery which sources of energy would resonate at the frequency needed to produce an electrical current for the purposes of EDM? Are you speculating their energy source was light? Perhaps from the Sun? I know we can measure a light source sound frequency signal voltage with an oscilloscope so it would be interesting to know how they were able to discover this as well. I believe the predecessor to the o-scope was an oscillograph which was a hand drawn chart (manual process) so it would stand to reason through some means they, too, were able to understand how to identify wave patterns and use them as and EDM. Thanks for the deeper thought process. You don't get energy from the piezoelectric effect. You put energy in to get the piezoelectric effect. Push electrons in, the crystal swells. Pull electrons out, the crystal shrinks back down. Put the crystal under pressure (look up the etymology of "piezo") and electrons come out. But they don't keep coming, and they go back in when you let off the pressure. You could create a circuit with those electrons, but you would get less work out of them than you put in to the crystal to get them to come out. Piezoelectricity has been known about for quite some time now. Have you never wondered why we don't make electricity this way? Put the crystal under pressure (look up the etymology of "piezo") and electrons come out. But they don't keep coming, and they go back in when you let off the pressure. AC. That's how piezo microphones work. Add a rectifier and you get DC. I said that.